Since 2000 I have worked as a specialist physician in the Haematology and Paediatric Oncology Department of SJD Barcelona Children's Hospital. I combine healthcare with research. Among my main areas of interest are paediatric Acute Lymphoblastic Leukaemia (ALL) and paediatric Philadelphia-positive leukaemias. I have been a member of the Spanish Society of Paediatric Haematology and Oncology (SEHOP) ALL production committee since 2013. I currently coordinate the SEHOP working group for the registration of Philadelphia-positive chronic myeloid leukaemia. Expert in ALL and CAR T-cell therapy. Doctoral thesis: "Clinical characterisation and prognostic factors in subgroups of paediatric patients with acute lymphoblastic leukaemia at a high risk of relapse". University of Barcelona, 2013. Specialist in Haematology and Haemotherapy, Hospital Clínic Barcelona, 1995. Bachelor's degree in Medicine and Surgery, University of Barcelona, 1994. Placement in the Cancer Immunotherapy department of the Children's Hospital of Philadelphia (United States), 2014. Placement in the Leukaemia and Lymphoma department of the Saint Jude Children's Research Hospital (United States), 2001. Member of the Spanish Society of Paediatric Haematology and Oncology ALL treatment protocol development committee (SEHOP/ALL 2013). Coordination of the SEHOP chronic myeloid leukaemia working group. 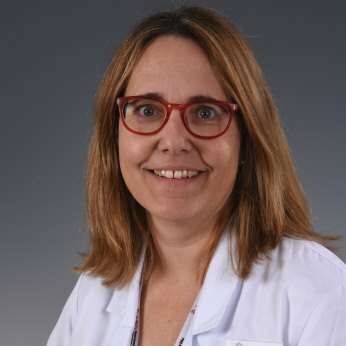 Member of the Spanish Society of Paediatric Haematology and Oncology committee for the treatment and diagnosis of falciform cell anaemia (SEHOP/ECF 2010). Maude SL., Laetsch TW., Buechner J., Rives S., Boyer M., Bittencourt H., Bader P, Verneris MR., Stefanski HE., Myers GD., Qayed M., De Moerloose B., Hiramatsu H., Schlis K., Davis KL., et al. Tisagenlecleucel in Children and Young Adults with B-Cell Lymphoblastic Leukemia. Infusion of tisagenlecleucel in a planned analysis in 75 patients with lymphoblastic leukemia. The general remission rate in 3 months was 81%. New England Journal of Medicine, 2018; 378(5):439-448. doi: 10.1056/NEJMoa1709866. Bautista F., Gallego S., Cañete A., Mora J., Diaz de Heredia C., Cruz O., Fernández J.M., Rives S., Madero L., Castel V., Cela M.E., Ramírez G., Sábado C., Acha T., Astigarraga I., Sastre A., Una Muñoz, Guibelalde M., Moreno L. Landscape of early clinical trials for childhood and adolescence cancer in Spain. Clinical and Translational Oncology, 2015 October 21. E-pub ahead of print. Berrueco R., Alonso-Saladrigues A., Martorell-Sampol L., Català-Temprano A., Ruiz-Llobet A., Toll T., Torrebadell M., Naudó M., Camós M., Rives S. Outcome and toxicities associated to chemotherapy in children with acute lymphoblastic leukemia and Gilbert syndrome. Usefulness of UGT1A1 mutational screening. Pediatric Blood & Cancer, 2015 62: 1195-201. Bento C., Percy M.J., Gardie B., Maia T.M., van Wijk R., Perrotta S., Ragione F.D., Almeida H., Rossi C., Girodon F., Aström M., Neuman D., Schnittger S., Landin B., Minkov M., Randi M.L., Casadevall N., et al. Genetic basis of congenital erythrocytosis: mutation update and online databases. Human Mutation, 2014; 35: 15-26. Rives S., Camós M., Estella J., Gómez P., Moreno M.J., Vivanco J.L., Melo M., Fernández-Delgado R., Verdeguer A., Fernández-Teijeiro A., Lendínez F., López-Almaraz R., Uriz J.J., Badell I. Spanish Paediatric Haemato-Oncology Group (SHOP/SEHOP). Longer follow-up confirms major improvement in outcome in children and adolescents with Philadelphia chromosome acute lymphoblastic leukaemia treated with continuous imatinib and haematopoietic stem cell transplantation. Results from the Spanish Cooperative Study. SHOP/ALL-2005. British Journal of Haematology, 2013; 162: 419-21. Collaborating lecturer on the Master's degree in Biomedicine at the University of Barcelona, since 2015. Collaborating lecturer on the Master's degree in Paediatric Nursing, since 2013. Coordinator, together with Dr. Ofelia Cruz, of the Master's degree in Paediatric Haematology at the University of Barcelona, since 2016.